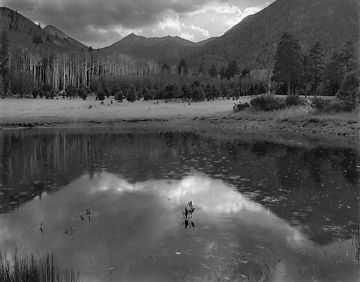 Lockett Meadow, Arizona. Copyright © Roy Pope. All rights reserved. 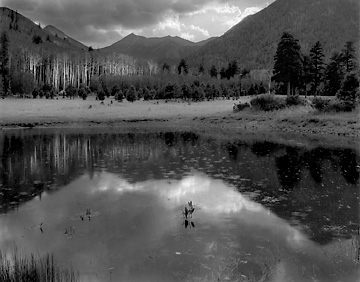 This image of Lockett Meadow, Arizona, is one of my newer images. On my first print I felt that the bright birch trees did not separate from the surrounding values very well, and some of the dark trees tended to merge with the background mountains and other values. I used a Highlight Mask to bring out the diffused birch trees and rain drop patterns in the pond. I then used a SCIM to separate the shadow detail in the pond and add shadow density amongst the dark pine trees. The negative was processed using Lynn's SLIMT approach for contraction. 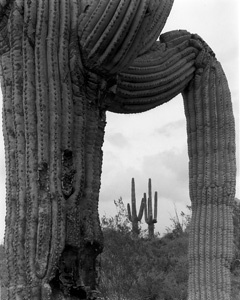 Saguaro, Apache Junction, Arizona. Copyright © Roy Pope. All rights reserved. I was photographing late in the day during the winter season in the desert. Foreboding storms had been rolling in and out all day. When printing "Saguaro," I want to reveal this ambience, to show the characteristics of the storms, and to convey the experience I had as I was making this photograph. While attending Lynn Radeka's Contrast Masking Workshop I selected "Saguaro" as the image to work on. During the workshop, the image was discussed and analyzed with Lynn and the workshop group in order to determine which masking solutions would hold the integrity of the stormy day, and reflect my involvement with the image. One of the challenges in printing this image was to simultaneously take advantage of a higher paper grade to add separation between the dark storm clouds and the sky, and to manage the inherent contrast of the photographic paper so as not to affect the overall balance of the image. The final photograph created during Lynn's masking workshop has kept the inherent visualized qualities I conceived at the time the image was made, offering a photograph that is a joy to print, and pleasure to view. A benefit when using the masking process is that it makes it possible for the photographer to explore post visualization potentials when making the fine print that would otherwise be unattainable in the traditional darkroom.